Today was much shorter than yesterday at only just over 15 miles. It was still pretty taxing. I was worried that I would be exhausted from yesterday and that my various knees and hips would be aching this morning, but I must be getting much fitter as after a solid 9 and a half hours of sleep I woke feeling fine. The ghastly hotel was somewhat redeemed by copious amounts of hot water in the (mouldy) shower, once I had figured out how to turn it on, but nothing really compensates for a crimson nylon ruched counterpane. My plan was to cross from Exmouth on the Starcross ferry from close by my hotel, however, after consulting the timetable (I know I should have done it before, but I didn’t), it transpired that the first crossing wouldn’t be until 10.40 and would then take half an hour. To walk up the Exe Estuary to the nearest crossing at Countess Weir and back would take several hours so I opted for the train around to Dawlish Warren. 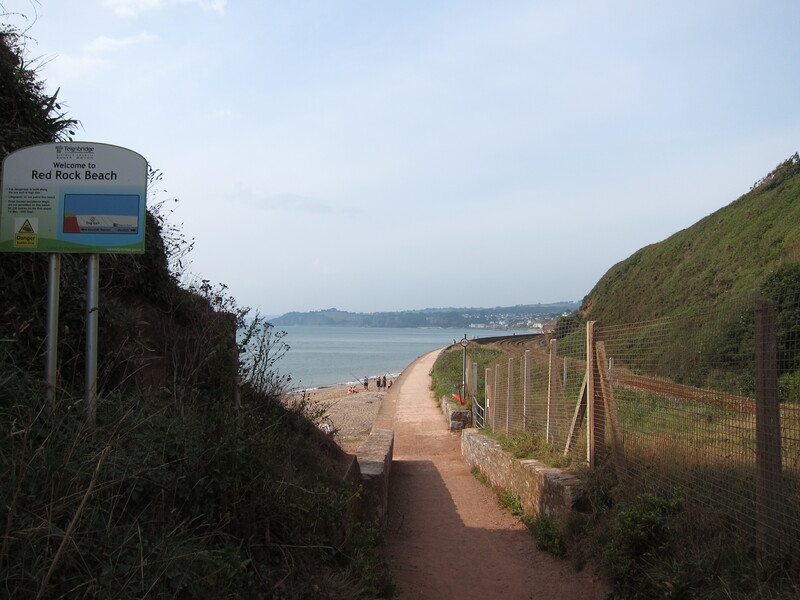 The walk from Dawlish Warren into Dawlish itself is easy enough- along the sea wall, parallel to the railway. The railway bed was originally carved out in 1839 for a new turnpike, but was eventually used for the railway in 1843, running all the way along the bottom of the cliffs to Teignmouth. I imagine the fishermen of Dawlish were very unhappy as the line cuts off the beach. I stopped in Dawlish for a delightful cream tea, even though it was only 11am. I burnt so much energy yesterday (and breakfast was not that big) that I was starving. 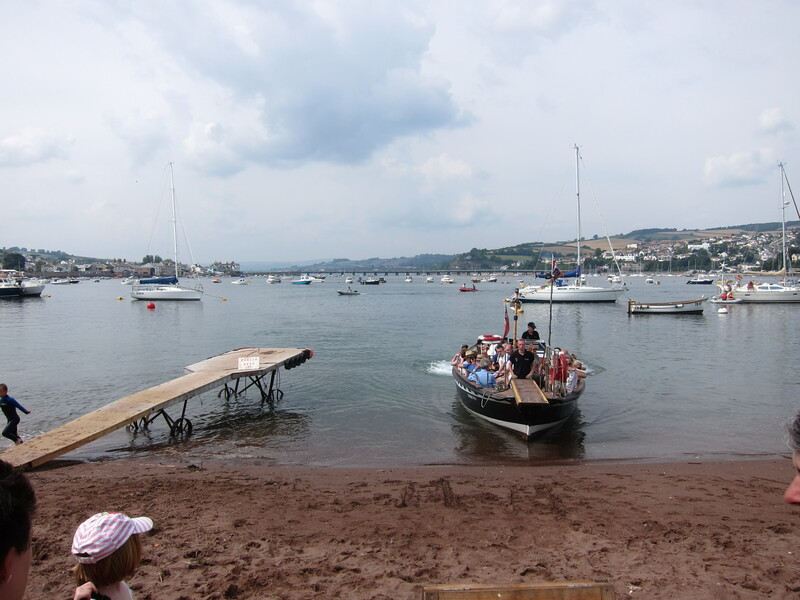 I had arranged to meet Bridget at the Teignmouth to Shaldon ferry at 1 pm, and was in very good time. We crossed on the dinky little black and white ferry, then took a short detour through Shaldon, which is very twee. Beautiful gardens overlooking the sea and a village green surrounded by superb Georgian houses, selling to rich Londoners at a million pounds a pop. We stopped for a drink before setting off, but began our ascent around 2pm. The path climbed steeply, then dropped over and over again, till we lost count of the number of ups and downs. It ran mainly through woodland, with occasional glimpses of the sea. After an exhausting 3 miles we heard an enormous clap of thunder and congratulated ourselves on the fact that the rain had passed us by – the path was wet but not too slippery. Unfortunately, we spoke too soon as the heavens absolutely opened with a torrential downpour that made the track extremely greasy and awkward underfoot. I was blessing Tom for lending me his cagoul – I should have been soaked to the skin without it. 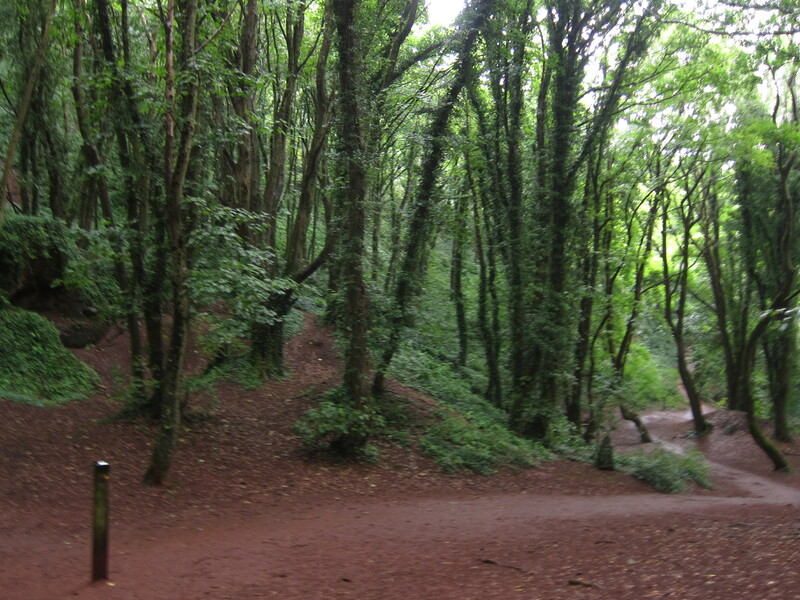 The path continued its crazy rollercoaster effect all the way to Babbacombe, where Bridget left me. I continued round to Anstey cove, but yesterday’s long day caught up with me so I took a bit of a short cut to my hotel. I do not think there is a single flat foot of ground between Shaldon and Torquay harbour. My hotel is rather superior to yesterday – a very traditional seaside boarding house. I am now in the Hole in the Wall pub -selected because no young children are allowed. I have had my fill of over tired, over sugared children in the last few days. A hilarious incident occurred on the table next to me. A French couple who don’t speak much English ordered “chicken pasta” and “a duck”. In due course, they arrived.